About 45 representatives of Huron County’s lower-tier municipalities, county employees and cyclists attended a one-day Bicycle Friendly Community Workshop Thursday in Holmesville. 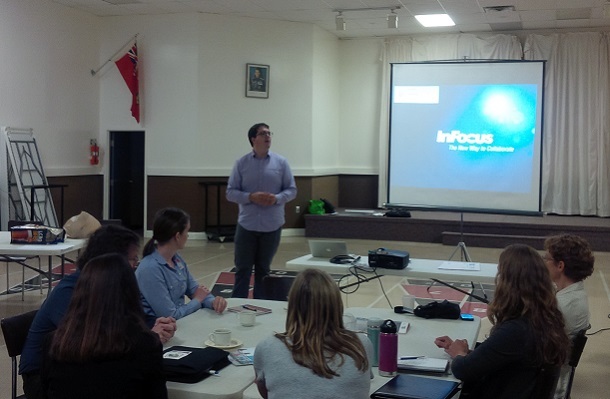 Justin Jones of the Share the Road Cycling Coalition explained the objective is to explore ways they can move forward with cycling in Huron County. Jones pointed out that means going beyond just lines on the road. He says that conversation often involves things like paved shoulders, trails and bike lanes, but he suggests a municipality would not put in a new swimming pool without offering training and swimming lessons, so you cannot create cycling infrastructure without programming to make cycling safer and more enjoyable. He suggests things like ‘bike month’, ‘bike to work day’ and ‘learning to ride’ courses. Jones also pointed out that while the workshop is about teaching cyclists how to ride safely, they also want to get the message out to motorists that it’s really not cyclists against motorists, but about everyone wanting to get from point A to point B safely. Jones explained that cycle-tourism has become a 391-million dollars a year industry, so if Huron County can get a piece of that, it would be a significant boost to the county’s economy.